We are currently looking for pictures of the club as it was then - can you help ? I remember going to that Buzzcocks gig and seeing Joy Division who were brilliant. Pete Shelley paid homage to Caberet Voltaire - he was a big fan. A couple of other gigs that stuck in my mind were Magazine (supported by a very young Simple Minds on their first tour) and the Police - both cost about £1.75! The first time I went I made a bit a prat of myself by trying to buy some tickets in advance ar the Top Rank Bingo place round the corner! Does anyone remember the Improvision nights on Sundays in the late 70's / early 80's. I saw The Jam there and remember seeing Hinkleys Heroes with Joe Cocker guesting; Joe threw up behind one of the speakers before he took the mic. One of the most memorable Sundays was seeing a celtic / rock band, Horslips. I bought the Book of Invasions album on the strength of that gig. My older brother went to the Magazine gig mentioned earlier (think it was the "Secondhand Daylight" tour) as I remember him coming back with bits of the merchandise display which ended up on his wall for a few years. Also, in 80-81 there was that "Rock against the Rates" thing and bands played free if you had a UB40. My brother worked at the Unemployment Benefit office and got me some blank UB40 (as I was in last year of school) and a mate went to get tickets. There were bands like Damned, Higsons, Bow Wow Wow, John Peel Roadshow, Exploited, The Fall, etc. all for free in the space of about 2 weeks! Abosolutely brill! Anyone remember that? Now I'm REALLY jealous ! I too was at a couple of the gigs mentioned. 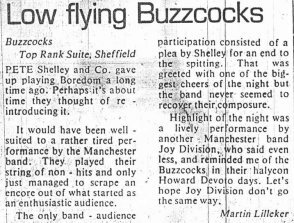 I saw Siouxsie And The Banshees,around 78/79 and im sure im correct in saying The Human League was supporting them.it was the original band and i can remember a slide show,things like Stingray and other 60s stuff. I also saw Magazine with Simple Minds,i can remember Life In A Day,Chelsea Girl and a few more. 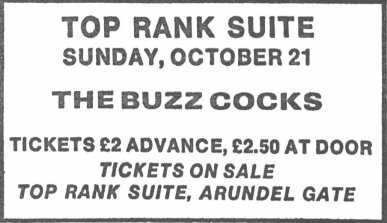 Im glad to hear The Top Rank may be reopening as a music venue again,those punk days were simply awesome.A great venue,plenty of bars,you could go upstairs and watch the drummer playing from nearly behind him. I can remember seeing the Clash in 77,hundreds queuing,the most unbelievable sights you've ever seen in your life.punk girls wearing bin liners and not much more. Live the Clash were fantastic,they were out of tune,Strummer couldn't sing but it all came together in those tremendous songs.Watching them steam into my favourite Clash song 'Safe European Home' was an experience ill never forget. I saw them 3 times at the Top Rank and once at The Lyceum. Anybody any memories to share of those punk days? Hey - don't give the wrong impression ! 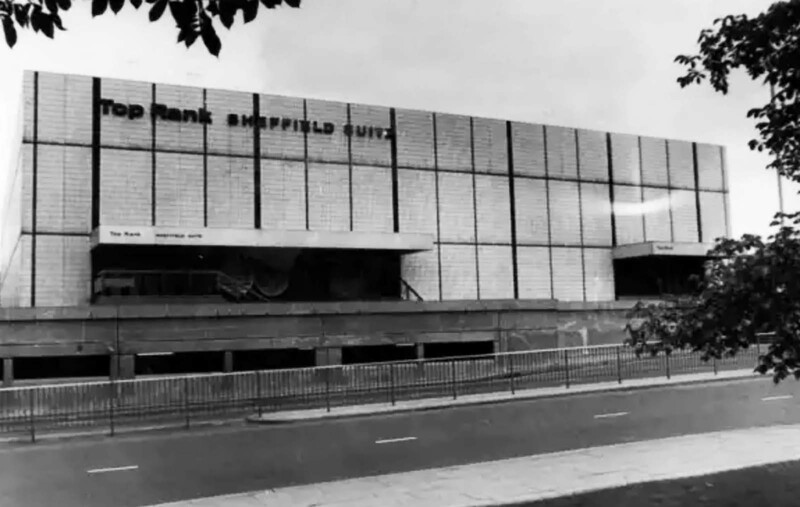 They were actually called "Rock ON the Rates" and I was so grateful to the Council or in truth the rate payers of Sheffield for their generosity! It was Altered Images that supported the Banshees when I saw them - I may have seen them a little later than you. A couple of other gigs that stuck in my mnd were Magazine (supported by a very young Simple Minds on their first tour) and the Police - both cost about ?1.75! remember seeing the police doing 3rd spot with two other bands (who I can never remember,headline band did the single off shore banking business the other I think were the comsat angels) in about '79.Also remember seeing Eddie and the hot rods who were so loud I couldn't hear properly for about 2 days after. I went to see the Police at Top Rank around then ( one of the support bands was defo the Cramps (and I am sure the other was an American band as well) - who were far better than the Police). Always stick in my mind as our Form teacher at School told us not to bother buying tickets as he knew Sting (they had been at teacher training college together) and would sort us tickets. Needless to say we ignored him (as did Sting). 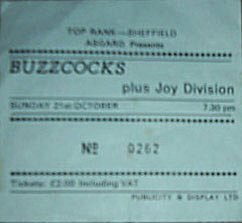 I remember the ticket was about Â£2.00 which was most of my pocket money for a week! That was the second time they played on the Kaleidoscope tour, Images had just released Dead Popstars. Please email me to discuss the book I am writing. I need stories like yours of the days at the top rank(I was also a regular there).. I went to jsut about all of them..damned(lots of fighting at that one)..uk subs...comsat angels...bow wow wow(with boy george as their dancer)..new order etc.. I remember at one Damned gig there me and my mate thought it would be a good idea to get backstage (I don't know why) we sneaked through a door to the right of the stage to be met be the sight of Dave Vanian stood in a coffin. Needless to say we decided this was a bit wierd and beat a hasty retreat! Martin. Hello. Dont suppose you will pick this up since your posting was Jan 2008!...but I am browsing looking for "Tiny" Ian Squires..from the punk days...particularly Stranglers/Clash of late 1970s and early 1980s. YES, I have loads of Top Rank/punk memories. Tiny,meself, Mick D, Fred, Mark from the kitchens, Squeaky al, etc...about 8 or 10 of us were taken on as "humpers" for all the Top Rank Gigs around that time. We brought in the bands amps, equipment and set up/took down stage, etc. We would usually get band freebies and an entry pass for the gig too. I did many of the punk bands, Clash, Damned, Siouxsie supported by Altered Images, Ramones, Sham 69, Undertones, SLF, and groups like Devo, The Police, etc,etc. Great days...great times and laughs/good friends. I lost touch with most of them after about the mid 1980s. If so, please ask him to get in touch, via the forum...with Steve...known then as Mashy or Mushroom. Did you manage to get any pictures of top rank and in particular of DJ Billy the Whiz Kid? He was my dad and was the top rank DJ from 1965-69. We don't have any pictures of him from that time of his life but he did say he was in the Sheffield Papers. If you can help I would love to hear from you! their support band was The police!! I still have the ticket, I will see if I can dig it out and sens a scan!